Oh the things that you think you know but don’t. So I purchase this boat thinking, ahh what can be so hard about shipping a boat 3 hrs away. Folks do it all the time. Ohhhhh nooooo, nothing is easy…First we are talking about an old wood boat, 7,000 lbs of old wood and god only knows what condition the fasteners are in. Not many guys are set up for this. Do not do one of those Internet search deals on this. The person you choose has to have done this at least 1000 times to be trusted. And with that experience, comes the knowledge of the correct trailer and tools. A trailer that hauls fiberglass boats or flat bed is a major no no and will cost you bucks or worse your life later. A damaged Keel, can sink your boat in a second. Here in Woodyboaterville we have just the guy. We call Bubbie…And trust me, Bubbie knows his ship. Bubbie is with Crown Marine in Deltaville VA he works all over the US, in fact this year he is delivering a nice boat from Wisconsin to the Clayton Show. By the way, if you have not made plans yet, this years auction is going to be a ton of fun. Woody Boater is one of the official Sponsors . Click here if you want more info on that.. Now back to the boat transport. 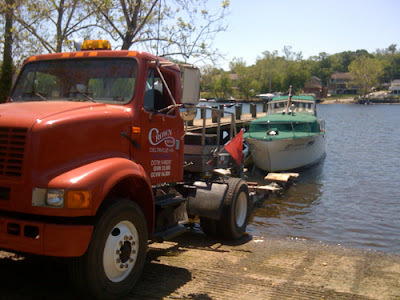 You will want to make sure that the trailer has Hydraulic pads that can softly support and lift your dream boat. It’s actually a very calm and simple event when done by a pro. Not to mention a knowledge of local permits and laws. Here are some shots from yesterday. Darn, I had to leave the office and actually go boating in the middle of the day…I like this new name.. In Search Of The Lost Sportsman! Calling All Woody Boaters! The trailer looks very well equipped for moving a woody boat. Now if she was found just 10 minutes away from home why did you need to move her 3 hours away? I shipped it to our home on the water. We have a spare dock. It's going to look like a boat show in a couple of weeks. Dear lord, the neighbors already think I am a nut. This will get me sent off to a farm.. There's a WoodyBoater Farm? Can I go too? Is that the same farm that Joe Martell was at? How did you come up with that name? Is that gold leaf? Looks good! Hey WoodyBoater, so we have a delema. 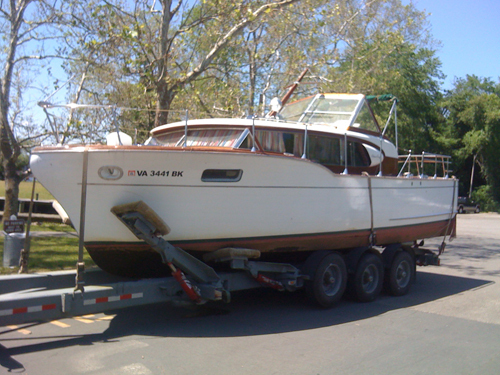 We want to transport a beautiful 57′ Chris Craft Constellation across country from LA to Florida. Regular boat transport companies say they can do this, but I am quite worried that it will not arrive in 1 piece. 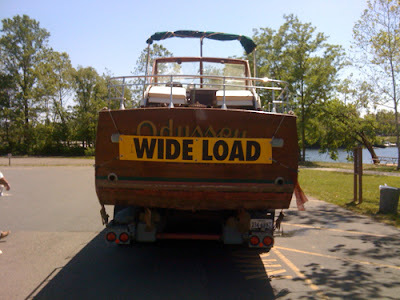 Also, loading out then in from a crane lift with straps is a huge concern for a multi-ton heavy boat. Fasteners are already popping out from our last load out to paint the bottom. Any suggestions on who we could hire to properly move this beautiful boat? Thank you! !